(CNN) - Republicans are on the brink of passing a nearly $1.5 trillion tax overhaul, and at this point, it looks like nothing can stop them. The House will is expected to vote on the plan Tuesday, and the Senate will take up the bill after, with a vote expected Tuesday or Wednesday. "This is going to be one of the great gifts to the middle-income people of this country that they've ever gotten for Christmas," President Donald Trump told reporters over the weekend. 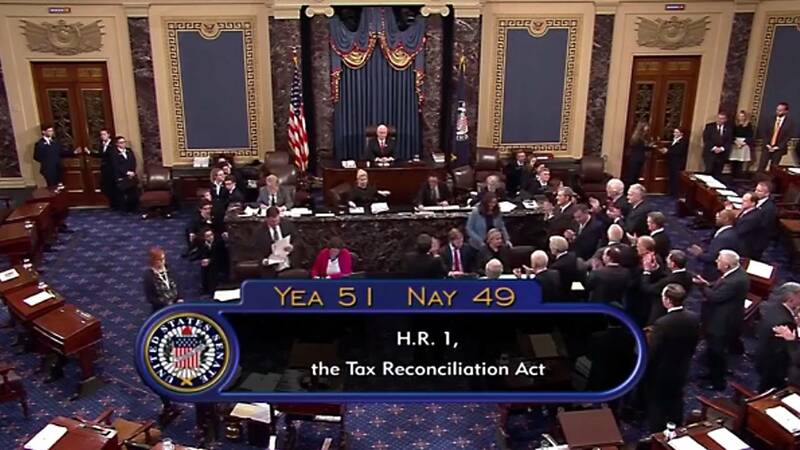 Republican leaders are confident that the votes will be there in the House and Senate this week on a bill that slashes the corporate tax rate, repeals the alternative minimum tax, drops individual tax rates and expands the child tax credit. And, despite the fact that no Democrats are expected to support it, and with news that Sen. John McCain is returning to Arizona and will be absent for the vote, all signs indicate that even with a narrow 52-48 majority overall, Majority Leader Mitch McConnell will still have the votes he needs in the US Senate. On Friday, Sen. Bob Corker, a Republican from Tennessee, stunned Washington and announced he'd back the bill despite the fact that the legislation still adds to the nation's deficit -- a fact he had once used to rationalize his opposition. "After many conversations over the past several days with individuals from both sides of the aisle across Tennessee and around the country," Corker said. "I have decided to support the tax reform package we will vote on next week." And, after GOP leaders announced they'd expand the refundability of the child tax credit, Sen. Marco Rubio, a Republican from Florida, who'd threatened to vote against the tax package without a boost to the tax credit, announced his support. Even with a few senators still on the fence, members are optimistic they'll have the bill on President Donald Trump's desk before Christmas, a remarkable position to be in given how elusive legislative victories have been for congressional Republicans all year. "I'm confident at the end of the day, the Senate will approve this conference committee report," House Ways and Means Chairman Kevin Brady said Friday. Rewriting the tax code was the kind of herculean lift many doubted Congress could pull off, especially after the Senate failed to repeal Obamacare last summer and again in the fall. But the pressure of delivering something -- anything -- weighed heavily on members, with some candidly confessing that donors had warned them to pass a bill or not bother asking for money next year when Republicans will be tasked with maintaining their majorities in both chambers. "My donors are basically saying, 'Get it done or don't ever call me again,'" New York Republican Rep. Chris Collins told The Hill earlier this year. Despite the outcries of some industry groups and lobbyists, Republicans not only overhauled the tax code in a matter of weeks, they also repealed a core piece of the Affordable Care Act. Republicans will vote this week to roll back the individual mandate -- the provision that requires Americans to have health insurance or face a fine -- that has long been considered key to keeping the Obamacare marketplace affordable. Cutting taxes and gutting Obamacare is a major step for Republicans that they hope can buoy their fading poll numbers and reverse some early indications -- like the Alabama Senate race where Democrat Doug Jones won -- that the GOP could face electoral setbacks in the upcoming midterms. "It's all about getting things done," said Rep. Mark Meadows, a Republican from North Carolina and the leader of the House Freedom Caucus. "If we don't get things done, we don't have to worry about the election in Alabama, we have to worry about our own elections back home." So far, signs are good that the tax bill could help them with their voters. A new Quinnipiac survey appears to show that Republicans are beginning to win back some support from their base for the first time in months. The new poll shows that 66% of Republican voters support the tax plan (even while other Americans do not). And, the poll also reveals that more GOP voters approve than disapprove of the way Republicans in Congress are governing 47% to 43%, the first time since this summer that more Republican voters have approved than disapproved of the job Republican lawmakers are doing. But despite the massive victory, the vote still comes at a time when the Russia investigation -- both with the Justice Department's special counsel and with Congress' separate probes -- hangs over the GOP agenda and Trump continues to voice his frustration with it. "We've got to get past this investigation. It's a giant distraction," Treasury Secretary Steve Mnuchin said on CNN's "State of the Union" on Sunday. "I think it should be over quickly. Since I think there's nothing there, it should be over quickly." The congressional investigations into the matter are ongoing as well, meaning that Republican members of Congress -- happier to discuss their gains in dropping the corporate tax rate than Russia -- are still forced to answer for it. But, Republicans will try to keep the focus on taxes this week. After all, it's the major overhaul they've been talking about for more than three decades. "We just wanted to give our workers and everybody in the country a fair, level playing field ... that's what this President said since he started running for President," said Sen. David Perdue, a Republican from Georgia. "That's what I said four years ago when I started running for the United States Senate."